At Serra High School, Lee was a year behind a stand-out wide receiver, Robert Woods, who also went to USC. As a senior, Lee had had 57 receptions for 1,409 yards and 24 touchdowns as a wide receiver and 45 tackles and three interceptions as a defensive back. Lee was considered one of the top high school recruits in 2011. A number of major NCAA Division I FBS college football programs offered him athletic scholarships and Lee made official visits to Florida, Miami, and Oregon before choosing to attend USC. While attending the University of Southern California, Lee played for the USC Trojans football team from 2011 to 2013. As a true freshman at USC in 2011, he earned a starting job at wide receiver across from his former high school teammate Robert Woods. He finished the season with 73 receptions for 1,143 yards and 11 touchdowns; due to sanctions, the 10-2 Trojans were prohibited from playing in either the inaugural Pac-12 Conference Championship game or a post-season bowl game. The combined receptions by Lee and Woods (184) and receiving yards (2,435) in 2011 were the most by a pair of Trojans in a season; Lee was awarded the 2011 Pac-12 Freshman Offensive Co-Player of the Year and named to the All-Pac-12 second team. As a junior in 2013, Lee played in 11 games, recording 57 receptions for 791 yards and four touchdowns. On January 3, 2014, Lee announced his decision to forgo his senior season and enter the 2014 NFL Draft. During his three-year career with the Trojans, he had 248 receptions for 3,655 yards and 29 touchdowns. The Jacksonville Jaguars selected Lee in the second round (39th overall) of the 2014 NFL Draft. He was one of three USC Trojans to be selected that year and was the first of two wide receivers the Jaguars selected, along with Allen Robinson (61st overall). On June 16, 2014, the Jacksonville Jaguars signed Lee to a four-year, $5.14 million contract that includes $3.18 million guaranteed and a signing bonus of $2.08 million. Throughout training camp, Lee competed against Ace Sanders and Allen Robinson for the vacant starting wide receiver position that was left open after the suspension of Justin Blackmon. During camp, he sustained a wrist injury and then suffered a leg injury. Head coach Gus Bradley named Lee the starting wide receiver to start the regular season, alongside veteran Cecil Shorts. He made his professional regular season debut and first career start during the Jacksonville Jaguars' season-opener at the Philadelphia Eagles and caught a season-high six passes for 62-yards in their 34–17 loss. The following week, he caught two passes for 14-yards, but left the Jaguars' 41–10 loss at the Washington Redskins in the second quarter after sustaining a hamstring injury that sidelined him for the next three games (Weeks 3-5). On November 30, 2014, Lee caught six passes for a season-high 75-yards and caught his first career touchdown on a 30-yard pass from quarterback and fellow rookie Blake Bortles during the Jaguars' 25–24 loss to the New York Giants. He finished his rookie season and only season under offensive coordinator Jedd Fisch with 37 receptions for 422 yards and one touchdown in 13 games and eight starts. Lee competed against Allen Robinson and Allen Hurns for the vacant starting wide receiver position left by the departure of Cecil Shorts. He missed the majority of training camp after suffering a knee injury and then suffered a hamstring injury that allowed teammates to surpass him on the depth chart. Offensive coordinator Greg Olson named Lee the fourth wide receiver on the depth chart to begin the regular season, behind Allen Robinson, Allen Hurns, and Bryan Walters. He was inactive for the Jacksonville Jaguars' season-opener against the Carolina Panthers due to his hamstring injury. He went on to miss another five games (Weeks 4-9) after aggravating his hamstring injury. On December 20, 2015, Lee caught two passes for 46-yards during the Jaguars' 23–17 loss to the Atlanta Falcons. The following week, he caught a season-high three passes for 26-yards and scored his only touchdown of the season in the Jaguars' 38–27 loss at the New Orleans Saints. He finished with his second season with 15 receptions for 191 receiving yards and one touchdown in ten games and one start. Lee entered training camp competing against Rashad Greene to be the Jaguars' third wide receiver on their depth chart. Head coach Gus Bradley named him the third wide receiver to begin the regular season behind Allen Robinson and Hurns. In Week 7, Lee made a season-high seven receptions for 107-yards during a 33–16 loss against the Oakland Raiders. Lee became one of the starting wide receivers for the remainder of the season after Allen Hurns suffered a hamstring injury that sidelined him for the last five games. On December 11, 2016, he caught five passes for a career-high 113 receiving yards in a 25–16 loss to the Minnesota Vikings. The following week, Lee returned a kickoff for a 100-yard touchdown as the Jaguars lost 21–20 at the Houston Texans. This marked his first career kick return for a touchdown. On December 24, 2016, he threw for his first career touchdown pass on a trick play call after receiving the football on a sweep and threw a 20-yard touchdown pass to a wide-open Blake Bortles, his quarterback. He also caught three passes for 37-yards and scored a 21-yard touchdown during the Jaguars' 38–17 win against the Tennessee Titans. He finished his last season under head coach Gus Bradley with 63 receptions for 851 receiving yards and three touchdowns in 16 games and six starts. He also returned 18 kickoffs for 545-yards and a touchdown. On January 9, 2017, the Jacksonville Jaguars announced that interim head coach and offensive line coach Doug Marrone would be promoted to their full-time head coach for the 2017 season. Throughout training camp, Lee and Allen Hurns competed to be a starting wide receiver alongside Allen Robinson. Offensive coordinator Nathaniel Hackett named Lee and Robinson the starting wide receivers to begin the season. Hurns replaced Robinson in the lineup after he tore his ACL in the Jaguars' season-opening 29–7 victory at the Houston Texans. In Week 2, Lee caught seven passes for a season-high 76 receiving yards during the Jaguars' 37–16 loss to the Tennessee Titans. On November 5, 2017, he caught a season-high eight passes for 75-yards and a touchdown in a 23–7 victory against the Cincinnati Bengals. In Week 15, he suffered an ankle injury and left during the second quarter of the Jagaurs' 45–7 routing against the Houston Texans. He was inactive for the next two games (Weeks 16-17) as head coach Doug Marrone opted to rest his starters for the Jaguars' upcoming playoff games. Lee finished with 56 receptions for 702 yards and three touchdowns in 14 games and 14 starts. The Jacksonville Jaguars finished atop the AFC South with a 10–6 record and secured a playoff berth. On January 7, 2018, Lee started his first career playoff game and had a five-yard rush and was only targeted once in the Jaguars' 10–3 victory over the Buffalo Bills in the AFC Wild Card Round. The Jaguars defeated the Pittsburgh Steelers in the AFC Divisional round and went on to lose 24–20 to the New England Patriots in the AFC Championship. Lee had four receptions for 42-yards during the Jaguars' playoff loss. On March 13, 2018, the Jaguars signed Lee to a four-year, $38 million contract extension. On August 25, 2018, in the third preseason game, Lee suffered a severe knee injury and had to undergo season-ending surgery. ^ Pedro Moura, Aunt: Marqise Lee's father to attend first USC game, ESPNLosAngeles.com, November 8, 2012, accessed November 10, 2012. ^ a b Pedro Moura, The rise of Marqise Lee, ESPNLosAngeles.com, April 20, 2012, accessed November 10, 2012. ^ "How USC's Marqise Lee beat the odds". Orange County Register. April 13, 2012. Retrieved January 31, 2018. ^ Klein, Gary (August 26, 2011). "USC is on the receiving end of Gardena Serra's work ethic". Los Angeles Times. ISSN 0458-3035. Retrieved January 31, 2018. ^ a b Marqise Lee, Rivals.com, accessed December 7, 2012. ^ Marqise Lee, Scout.com, accessed December 7, 2012. ^ "Marqise Lee College Stats". College Football at Sports-Reference.com. Retrieved January 31, 2018. ^ Pedro Moura, Analyzing the season-opening depth chart, ESPNLosAngeles.com, August 29, 2011, accessed December 7, 2012. ^ "Marqise Lee 2011 Game Log". College Football at Sports-Reference.com. Retrieved January 31, 2018. ^ "2011 USC Trojans Schedule and Results". College Football at Sports-Reference.com. Retrieved January 31, 2018. ^ Marqise Lee stats, ESPN.com, accessed December 7, 2012. ^ Marqise Lee bio, USCTrojans.com, accessed December 7, 2012. ^ Paul Myerberg, USC wide receiver Marqise Lee sets a Pac-12 record in loss, USA TODAY, October 27. 2012, accessed November 10, 2012. ^ Pedro Moura, USC starts Heisman campaign for Lee, ESPNLosAngeles.com, November 7. 2012, accessed November 10, 2012. ^ Rich Hammond, USC’s Lee, Williams win Pac-12 football honors, 'Orange County Register', November 26, 2012. ^ Gary Klein, USC football: Marqise Lee wins Biletnikoff Award, Los Angeles Times, December 6, 2012, accessed December 6, 2012. ^ Walter Camp 123rd All-America Team Archived December 10, 2012, at the Wayback Machine, Walter Camp Foundation, December 6, 2012. ^ Richard Hammond, USC's Lee becomes unanimous All-American, Orange County Register, December 14, 2012. ^ "Marqise Lee 2013 Game Log". College Football at Sports-Reference.com. Retrieved January 31, 2018. ^ Gary Klein, Marqise Lee making another big leap at USC, Los Angeles Times, March 27, 2012, accessed December 7, 2012. 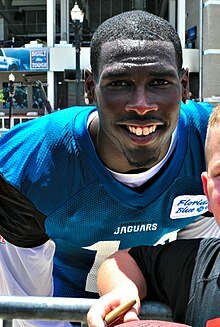 ^ a b "Spotrac.com: Marqise Lee contract". Spotrac.com. Retrieved March 12, 2018. ^ Crowe, Alfie (May 29, 2014). "Jaguars wide receiver depth chart will be training camp battle". bigcatcountry.com. Retrieved March 12, 2018. ^ Wells, Adam (August 13, 2014). "Marqise Lee Reportedly Avoided 'Serious' Leg Injury After Being Carted Off". bleacherreport.com. Retrieved March 12, 2018. ^ "Ourlads.com: Jacksonville Jaguars' Depth Chart: 10/01/2014". Ourlads.com. Retrieved March 12, 2018. ^ "Jacksonville Jaguars at Philadelphia Eagles - September 7th, 2014". Pro-Football-Reference.com. Retrieved January 31, 2018. ^ "Jaguars WR Marqise Lee out vs. Steelers with hamstring injury". SI.com. October 1, 2014. Retrieved March 12, 2018. ^ "New York Giants at Jacksonville Jaguars - November 30th, 2014". Pro-Football-Reference.com. Retrieved January 31, 2018. ^ "Marqise Lee 2014 Game Log". Pro-Football-Reference.com. Retrieved January 31, 2018. ^ Reier, Evan (July 15, 2015). "What Marqise Lee Injury Issues Mean for Jacksonville Jaguars in 2015". bleacherreport.com. Retrieved March 12, 2018. ^ McCormick, Terry (August 5, 2015). "Receiver Marqise Lee suffers another injury in camp". 247sports.com. Retrieved March 12, 2018. ^ "Ourlads.com: Jacksonville Jaguars' Depth Chart: 10/01/2015". Ourlads.com. Retrieved March 12, 2018. ^ Smith, Bradley (September 15, 2015). "Panthers at Jaguars: Game Day Inactives List". catscratchreader.com. Retrieved March 12, 2018. ^ "Jaguars taking extra time with Marqise Lee's injury". foxnews.com. November 3, 2015. Retrieved March 12, 2018. ^ "NFL Player stats: Marqise Lee (2015)". NFL.com. Retrieved March 12, 2018. ^ "Marqise Lee 2015 Game Log". Pro-Football-Reference.com. Retrieved January 31, 2018. ^ DiRocco, Michael (November 10, 2016). "Remember when people wanted Jaguars WR Marqise Lee traded or cut?". ESPN.com. Retrieved March 13, 2018. ^ "Daily Fantasy Cafe: Jacksonville Jaguars' Depth Chart". dailyfantasycafe.com. Retrieved March 13, 2018. ^ "Oakland Raiders at Jacksonville Jaguars - October 23rd, 2016". Pro-Football-Reference.com. Retrieved January 31, 2018. ^ Daniels, Tim. "Allen Hurns Injury: Updates on Jaguars WR's Hamstring and Return". bleacherreport.com. Retrieved March 13, 2018. ^ "Minnesota Vikings at Jacksonville Jaguars - December 11th, 2016". Pro-Football-Reference.com. Retrieved January 31, 2018. ^ "NFL Game Center: Week 15-2016: Jacksonville Jaguars @ Houston Texans". NFL.com. Retrieved March 13, 2018. ^ "Tennessee Titans at Jacksonville Jaguars - December 24th, 2016". Pro-Football-Reference.com. Retrieved August 19, 2017. ^ "Marqise Lee 2016 Game Log". Pro-Football-Reference.com. Retrieved January 31, 2018. ^ "NFL Player stats: Marqise Lee (career)". NFL.com. Retrieved March 13, 2018. ^ Rosenthal, Gregg (January 9, 2018). "Jaguars hire Doug Marrone to be new head coach". NFL.com. Retrieved March 13, 2018. ^ Johnson, Jay (June 24, 2017). "Could Marqise Lee beat out Allen Hurns to be the Jags No. 2 WR?". jaguarswire.usatoday.com. Retrieved March 13, 2018. ^ "Ourlads.com: Jacksonville Jaguars' Depth Chart: 09/01/2017". Ourlads.com. Retrieved March 13, 2018. ^ Day, Ryan (December 17, 2017). "Jaguars injury news: Marqise Lee will be back for playoffs, if not before". bigcatcountry.com. Retrieved March 13, 2018. ^ "Marqise Lee 2017 Game Log". Pro-Football-Reference.com. Retrieved January 31, 2018. ^ "2017 Jacksonville Jaguars Statistics & Players". Pro-Football-Reference.com. Retrieved January 31, 2018. ^ "Wild Card - Buffalo Bills at Jacksonville Jaguars - January 7th, 2018". Pro-Football-Reference.com. Retrieved January 31, 2018. ^ "AFC Championship - Jacksonville Jaguars at New England Patriots - January 21st, 2018". Pro-Football-Reference.com. Retrieved January 31, 2018. ^ Patra, Kevin (March 13, 2018). "Staying in Duval: Jaguars re-signing Marqise Lee". NFL.com. ^ Patra, Kevin (August 27, 2018). "Marqise Lee will undergo season-ending knee surgery". NFL.com.